We're not in Kahului anymore, Dorothy! After eleventy-billion days of rain in a row in Hawaii, Ol' Momma Nature had a couple more jokes in store for us. Our flight out of Honolulu was delayed more than an hour because they had a ground delay in Kauai due to weather in Honolulu. The weather in Honolulu is rarely bad enough to require instrument approaches but when it is, everything grinds to a halt. We made it just in time for our departure from Honolulu to Los Angeles. That's where things got dicey. It seems that Delta decided to have our connecting flight departing from an entirely different terminal. As we were taxiing to the terminal the flight attendant told us fanciful stories about a shuttle that would whisk us away across the tarmac to the other terminal and all would be well. No such luck. For some reason the tunnel leading to the bus stop was closed. Our only choice was to wait around for a different airline's shuttle to take us to a different terminal, wait there for yet another shuttle and MAYBE make it to the terminal on time to catch our flight. The other alternative was to leave the terminal and walk to the other one and go through security screening all over again. What a way to run an airline. Our arrival in Butte was greeted with a bit of snow falling from the sky. 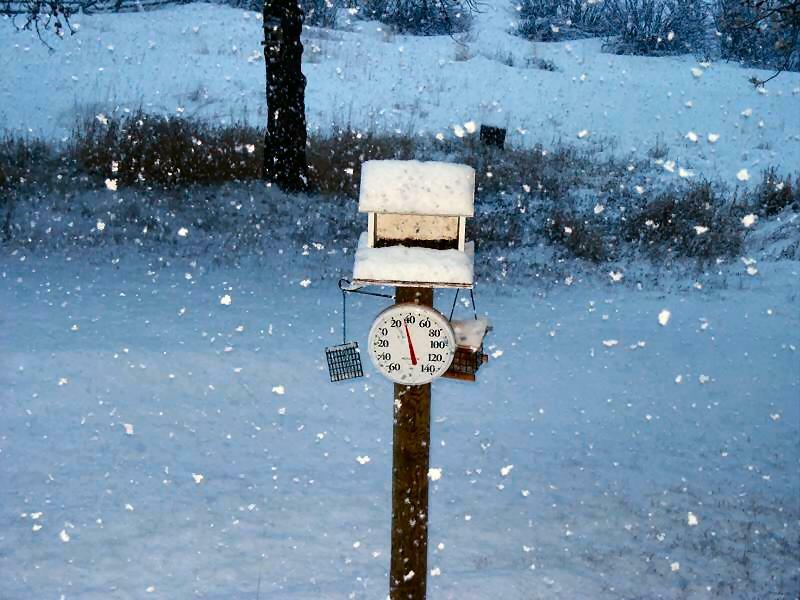 We woke up the next morning with eight inches of new snow on the ground and sub-freezing temperatures. Not a good thing to see considering we were planning on departing on the trip on the 8th. After installing a new battery in the LT and resurfacing and painting the battery hold down bracket I poured in 5½ gallons of fuel and turned on the ignition. First thing I noticed was the fuel pump didn't kick on. Not Good. After a few minutes of troubleshooting (check the connections, check the fuses, look for voltage at the terminals, etc) I was about at my wits end when I noticed the fuel injector computer still sitting on the tailpiece. "Hmmm..." thought I, "That doesn't belong there..." I got so wrapped up in anti-rusting the bracket and getting the battery installed and starting the bike I forgot to put the brain back in the bike. Sure enough, soon as the brain was reinstalled (and my brain engaged) it fired right up. All the wires and cables for the GPS, intercom, cell phone, and heated clothing has been installed. We took it out for a test ride yesterday. Getting from the garage to the road was the hardest part of the ride. Once we were on the road we started testing everything. GPS XM weather display? Check! Damn! This stuff gets hot fast. After about 30 seconds I'd had enough and shut it off for the rest of the day. With long pants, long sleeve shirt, heated chaps, heated vest, and lined First Gear jacket and pants I was plenty warm all day. At one point I even had to open things up because I started sweating (it was around 40° at the time). I probably won't use mine very much but I'll be glad to have it if I need it. The weather is still a bit iffy... The XM Weather forecast for our route for the first few days is showing partially cloudy right now. It's the 'tween time that has me concerned. Looks like severe storms and snow for the next couple days. Not really sure what it's supposed to be like beyond that but we'll play it by ear as we go. As of now, the Four Corners part of the trip has been nixed. We are still planning on hitting Key West and Blaine but Madawaska may have to wait for another trip. Because of the Forest Service 'team' position we've accepted we really have to try sticking to a schedule. Not really the way I wanted it to play out but I guess all will be well. Still have a couple things yet to do to the bike. The new saddle bag rail arrived via FEDEX this morning so that's got to be installed. I replaced the left rail a couple years ago because of a lane-splitting incident with a beer truck and noticed how much more snug the saddle bag fit was as a result of the new rail. I wanted the other side to be as secure so I got a new rail for the right side. After ten years of on-and-off with the saddle bags they wore down a little bit. If all works out well, we'll be leaving from Butte on Saturday morning.